This week, we approached culture in diaspora in its dimension of hybridity. In order to master its unruly landscape, we tackled it in two related fashions. Frist, we discussed the topic of theme and variations. Our core case studies were: Exercises in Style (1947) by Raymond Queneau (1903-1976), a collection of 99 variations on a basic narrative; and “the mother” of all musical themes and variations, aka Johann Sebastian Bach’s Goldberg Variations (published in 1741). Here, we pointed to two (well, perhaps three) elements of interest. Moving away from the idea of building musical variations on a melodic theme, Bach used the bass line, rather than the melody, of the introductive Aria as the generative structure upon which each of the following 30 variations were composed. This approach tends to make the elements of continuity in the structure of the variations somewhat imperceptible to the listener. By connecting the variations via an underlying inaudible structure, Bach was thus able to use the variation as a template to build upon the stylistic canons of music past and present, crafting each individual variation as a summa of diverse musical ideas. The GV stand before us as both an anthology (or “collection,” a museum of sorts) of musical thought, and an archive of the invisible. We will investigate the related notions of collections, archives, and invisibility, in the coming weeks. For now, we focus on how to recognize patterns that tie together seemingly unrelated narrative units, and therefore how to “map” a unified atlas of cultural diversity. In continuing to explore musical connections, we also examined how Uri Caine designed an innovative, yet faithful, approach to Bach’s Goldberg Variations under the sign of cultural hybridity (2000). We also noticed how Kun exposued the agenda of cultural (musical) hybridity in a contested political space. This allowed us to bring our opening theme — the relationship between culture in movement and the status of stateless refugees, displaced persons, and “undocumented” immigrants — back into our conversation. The “two countries” celebrated, and deeply questioned, by Los Tigres del Norte, pointed us to notions of cultural (when not existential) hybridity, of poly-identity, and multiplicity, which are inherent to diasporas. Can the structure of diasporas be explained in terms of invisible themes and hybrid variations? Can diasporas (and cultures in motion) ever be “mapped,” or is their natural fluidity resisting such attempts? In order to answer these questions, we worked on the etymological hybridity of the constellation of concepts that surround the notions of diaspora. Thus, the overlapping and conflicting notions of diaspora, as dispersion and as exile, as loss of political referents and of divine protection, and the meanings acquired by the word, diaspora (including its etymology), provided us with a series of theoretical questions. 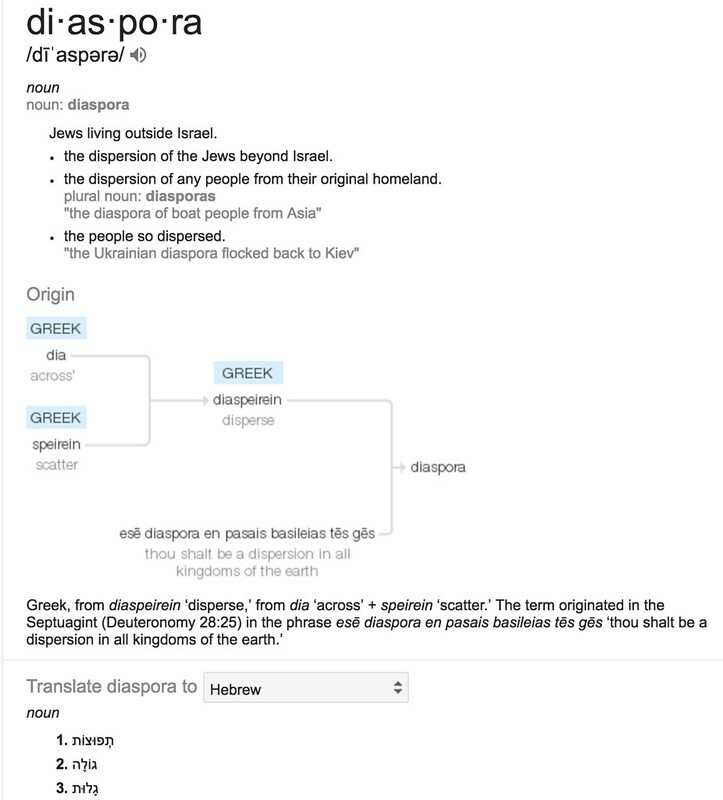 Among other things, we noted how the word diaspora, a Greek noun initially used to described the dispersion of the Jews, appears in most language in its Greek form, while in Hebrew it corresponds to a series of terms that share very little with their universally used Greek correspondent. The challenges in “mapping out” (or explaining) the cultural hybridity of diaspora also provided us with a series of practical issues. Here’s an attempt to map Jewish diaspora through time and space. 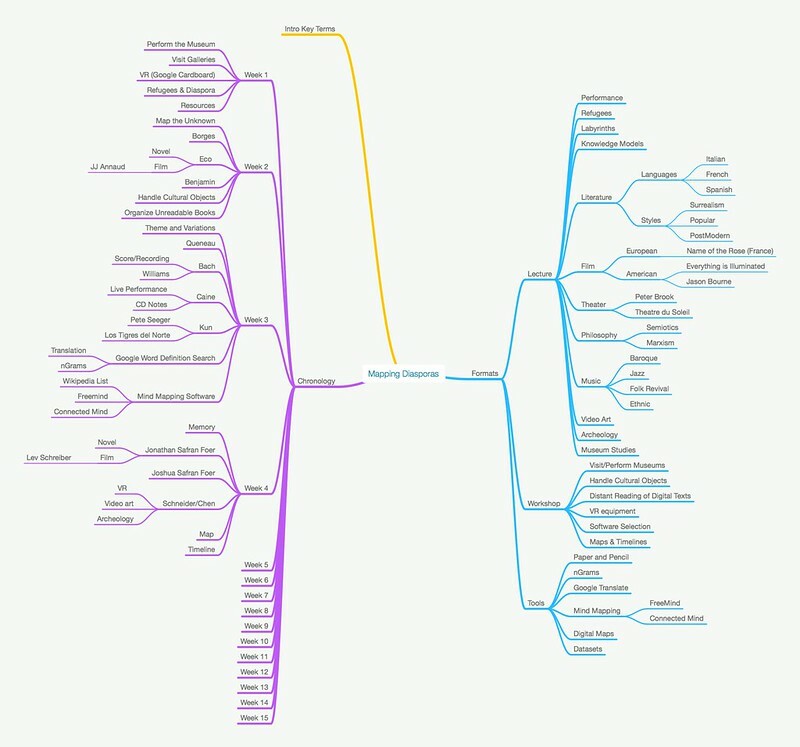 It is presented in the form of a “mind map,” and is the work of the artist Ward Shelley (b. 1950). We will continue to refer back to these tools in the coming weeks, as we proceed to explore and evaluate new ones.